Yes! 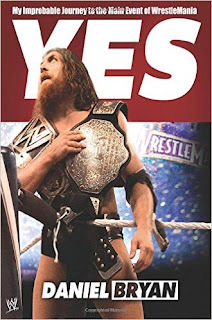 : My Improbable Journey to the Main Event of Wrestlemania is the latest New York Times Bestselling autobiography by none other than internet fan-favourite wrestler, Daniel Bryan (aka. Bryan Danielson). The book takes us through a journey from his independent wrestling roots to his current run as a WWE superstar. We follow him on his humble journey as he lives off of peanut butter sandwiches, jet-setting across the world to make a few bucks and finally landing himself in the WWE, the wrestling world’s biggest stage. He shares some stories about his family and about falling in love (with current Diva, Brie Bella). Although the broad span of the book covers his early career journey, each chapter opens with a short story on the days leading up to the biggest match of his career: main eventing Wrestlemania (28). If you’ve followed the WWE the past few years, you’ve undoubtedly seen the popular Bryan, or at least his famed YES chants which has been seen across a wide variety of live sporting events. The heavily bearded Bryan is the poster boy for the underdog so much that that particular aspect has been woven into many of his storylines. He’s small, he’s pale, he’s supposedly uncharismatic and yet, people love him. Perhaps more so than the Rock, Daniel Bryan may be a true people’s champion. I’ve only read a few wrestling biographies, that from Bret Hart and two from Chris Jericho. The journeys between the three wrestlers have a lot of commonalities. All three were undersized wrestlers (and thus, not seen as true champions), all three were arguably underdogs in the eyes of the fans, and all three are established technical wrestlers. Perhaps it speaks more to my taste in wrestlers. I have to say though, between the wrestling biographies that I’ve read, I feel as though Yes! was the least entertaining. Although I have no way of truly knowing, it feels as though part of the problem may have been being filtered through WWE’s publishing process. A lot of the emotion that I was hoping to feel felt very muted. A lot of details and stories I was hoping to hear about were completely left off the book (i.e. the story of AJ Lee, his thoughts and reactions to various wrestling deaths, etc). I can’t help but feel that if his story was published outside of the WWE confines (like that of Hart and Jericho), that it could have been more honest. There was so much more emotion in the biographies of Hart and Jericho. I could really get behind their struggles. That’s not to say that the book is dishonest! Bryan gives really candid thoughts on the current wrestling scene, which he calls a parody of wrestling. And he’s right. Go to any indie wrestling event to watch wrestling. Go to any WWE show to see a cartoon. I would still recommend the book if you are a Daniel Bryan fan, but I do feel the story pales in comparison with Hart and Jericho’s biographies. But perhaps that’s not saying too much, as those biographies are some of my favourite books in general, outside of just wrestling biographies. Til next time, later geeks!